Bring time tracking into QuickBooks. "Timecamp has become an essential part of my work flow. I am very happy to be able to track time in this way as I have tried many, many tools and integration with QuickBooks is the simplest and easiest to use." 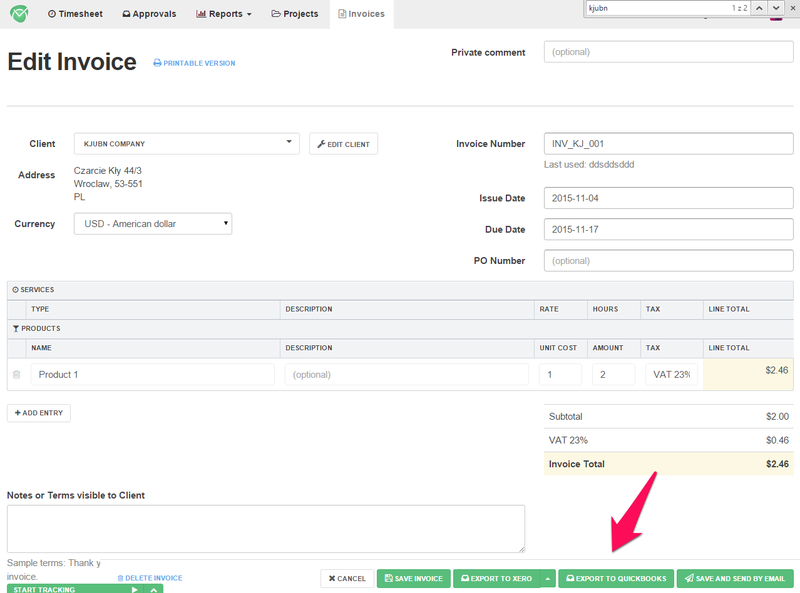 Your clients will be imported to TimeCamp as your projects (in TimeCamp you can assign time to them and include this time in your invoices). 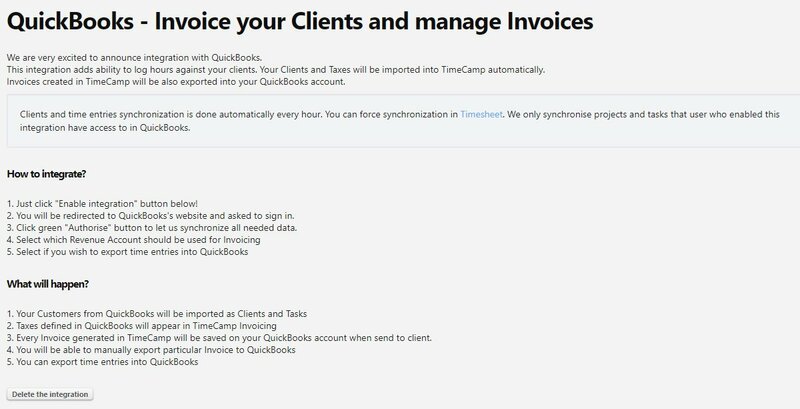 All clients and taxes will synchronize automatically between TimeCamp and QuickBooks. You will get the possibility to export your time entries to QuickBooks (keep in mind that in case of enabled approval module you will need to approve entries first). 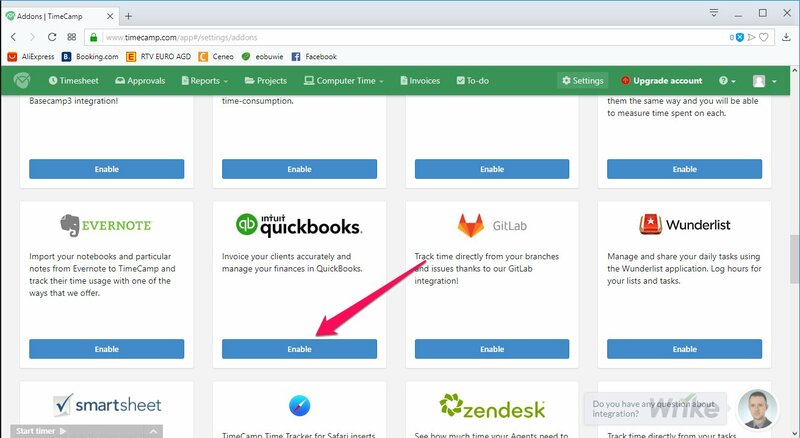 You can export your users into QuickBooks if they own “Display name” ( below screenshot will show you where to enter the display name in TimeCamp, and where to find it later on in QuickBooks). Import the billing rates for different users. Invoices created in TimeCamp can be exported to QuickBooks. You can enable the integration both from TimeCamp and QuickBooks side. 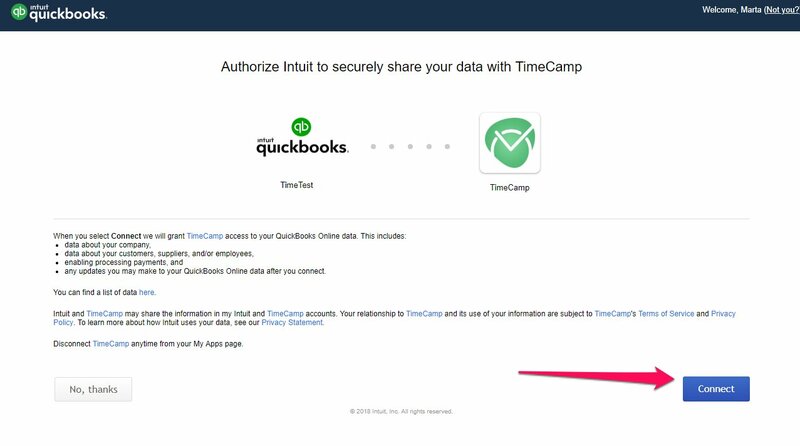 Keep in mind that TimeCamp integrates with QuickBooks Online version only. 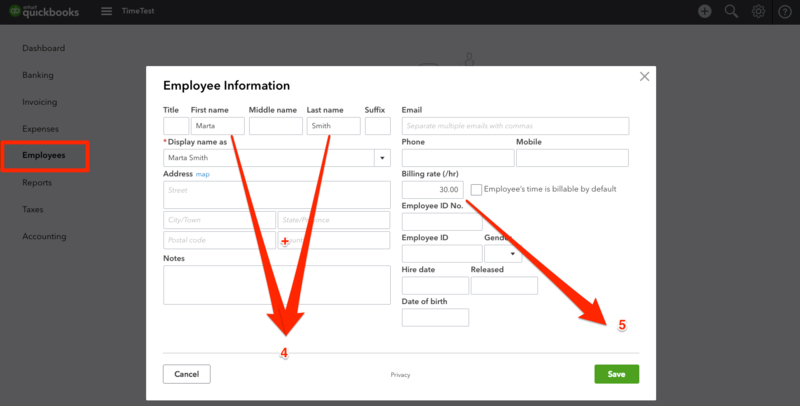 To activate QuickBooks integration from your TimeCamp account you’ll need administrator privileges. Login to your TimeCamp account and navigate to Settings. Select the Add-ons bookmark and find QuickBooks on the list. Click on the “Enable” button. You’ll be able to read about integration on the next page. To start, click “Connect to QuickBooks” button. You’ll be redirected to QuickBooks page and asked to log in to your QuickBooks account. Choose the company you want to integrate with QuickBooks and Authorize access to your QuickBooks account. Importing your data might last a while, but the process is secure. Your clients will be imported to TimeCamp both for time tracking module, as well as for invoicing purposes. You can now track time spent on your customers. It can be later easily invoiced. Invoices created in TimeCamp can be exported to QuickBooks, along with clients and taxes. To export an invoice, open it in TimeCamp. You’ll find the export button at the bottom of the invoice. You can deactivate QuickBooks integration from the same place you’ve been enabling it. Simply go to the Settings and navigate to Add-ons. Find the QuickBooks and once you enter its settings hit “Delete the Integration” button.